Bike for Good is a social enterprise and charity which provides access to excellent quality refurbished bikes whilst diverting tonnes of waste from landfill. They also offer a comprehensive programme of inclusive projects which promote, support and encourage greater levels of cycling. Cycling has a multitude of benefits for society. It helps to improve the environment we live in, the way we feel inside and out and gives us skills for life. Bike for Good have created a series of cycling themed projects such as Pedal Pathways and Wheelbeing which seek to highlight this to the public and fill a gap in current provision. Pedal Pathways works with women from across Glasgow who are looking for a way to build physical activity into their already busy lives. Our group cycling sessions offer a pathway for women, mainly from black, minority and ethnic backgrounds, to improve their skills, increase their health and wellbeing and take on leadership opportunities by training to become Ride Leaders. They work directly with community groups and organisations to reach women who wouldn’t self-refer to a cycling group such as Gendale Women’s Cafe, Govern Community Project, Tomorrow’s Women, rEstart, SEAL Women’s Group, Glasgow Women’s Library, Saheliya and Kinning Park Complex. Thanks to the support from the Spirit of 2012, they have worked with over 200 women since the project started in October 2017. Founded by the Scottish Government’s Smarter Choices Smarter Places fund, The Robertson Trust, NHS Health Improvement Team South and the Bupa Foundation, their Wheelbeing project reaches people who would benefit from a more active lifestyle by working directly with community base organisations. They offer one-to-one and group cycling opportunities as well as training in bike mechanics. The majority of Wheelbeing participants are new to the city, often seeking asylum and therefore have no access to a bike or the funds to purchase one. To address this, they teamed up with Nextbike and CoMo UK to offer free access to the city wide Nextbike hire scheme. They have distributed over 200 free or low cost memberships to their Wheelbeing participants, each receiving additional support such as translated user-guides, lessons on how to use the hire-scheme and city route planning sessions. Men do nearly three times as many cycling journeys as women and travel more than four times as far. Women from BAME communities are even less likely to cycle. 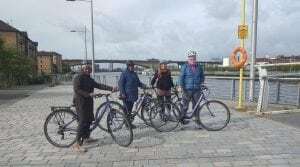 Pedal Pathways aims to address this by offering a cycling engagement, training and leadership programme designed by and for vulnerable women across Glasgow. They also know that women lack the confidence to cycle on the roads, so offer a bespoke cycle training programme that builds up their self-awareness and on-road confidence levels. Women also told them that they don’t feel like they belong on a bike. This can be attributed to the lack of ‘everyday’ female role models who can be seen on Glasgow’s roads, particularly those from BAME communities. To address this they use female trainers who take on mentoring roles and have encouraged participants to become cycle ambassadors. To celebrate this, they organised a ‘Women who Cycle’ photo-shoot on International Women’s Day and hosted an exhibition in their Community Hub to showcase women on bikes! Wheelbeing supports people with multiple barriers to acitivity, to increase their physical and mental wellbeing. They do this by enabling and encouraging them to fit cycling into their everyday lives. The project focuses on Glasgow’s most deprived wards where statistics show that residents are at an increased risk of long term physical and mental health conditions and low life expectancy. Over 200 women have attended one or more Pedal Pathway sessions which includes group rides, 1:1 sessions and events. At least 20 women have learned to cycle who could not before. 5 topical film nights (with up to 185 people) to inspire women to use a bike for personal and mental development. 2 Cycling and Wellbeing days with 25 women focussing on yoga for the body and mind, maintenance for the bike and healthy food for everything! 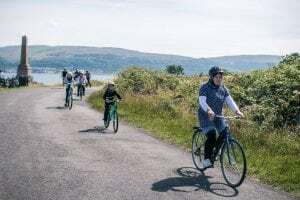 A trip to Millport for women and their families to enjoy a cycling adventure! Some of these women previously could not cycle at all and for most, it was the first time on a Scottish island. 60% of women engaged in Pedal Pathways say their health and wellbeing has improved, thanks to events like the Cycling and Wellbeing days featuring yoga, bike maintenance, healthy food abd a bike ride. At least 8 women will shortly take up leadership training and development opportunities, so they can take ownership of their cycling groups. Almost all say their confidence has increased and that they are more likely to cycle thanks to the group. With her new bike, Lesley-Anne intends to cycle every day as her main mode of transport and she continues to attend the weekly group rides. The rides offer a chance to meet socially, explore the city by bike and get some excerise without the need to fork out on expensive kit or gym memberships. She has also attended their Cycle and Wellness sessions, trying yoga for cyclists, meditation and learning bike maintenance. Over 300 people have participated in a Wheelbeing course or session. 75% of their service users told them that they felt much healthier and fitter at the end of their 8-week cycling programme. They saw an average increase of 10 points in participants feeling of wellbeing (3-8 points is considered meaningful improvement – Warwick Edinburgh Mental Wellbeing scale). The average active minutes per week increased by 64%, going beyond the recommended weekly target of 150 minutes. In August 2018, Wheelbeing participants using their free or low cost Nextbike membership generated over 2000 journeys on Nextbikes! Targeted specifically at those on a low income, the project is about social inclusion and increasing access to a low cost transport option. Results from their evaluation model show that over a third of beneficiaries are refugees/asylum seekers, over 50% are unemployed ad over 80% don’t have access to a bike.